To be truthful the Family Lines System was never actually an operating railroad, it was merely a marketing tactic which brought together the allying lines of the Louisville & Nashville, Clinchfield, Seaboard Coast Line, and a number of other smaller road (such as the Georgia Railroad, Atlanta & West Point Railroad, and Western Railway of Alabama otherwise referred to as the West Point Route). With this came a new livery (not unlike the later Seaboard scheme) applied to all with sub-lettering stenciled under locomotive cabs identifying the specific company. This marketing scheme was also short-lived, lasting only from 1972 until 1982 when these railroads merged together formally to create the Seaboard System (itself operating for only a few years). 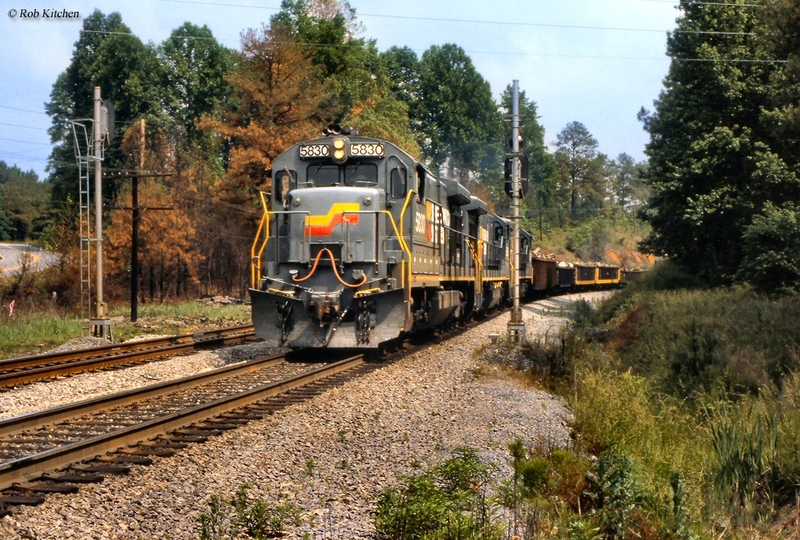 The three main components of the System were the L&N, Clinchfield, and SCL. The L&N (the first component) was a railroad synonymous with the southern states; it served major cities from New Orleans and Memphis to St. Louis, Atlanta, and later Chicago. The L&N is also one of the few classic fallen flags to never have had its original chartered name change at any point throughout its history, serving its home state and the southeast for over 120 years. As the L&N itself disappeared into the Seaboard System in 1982 just a few years later the Seaboard itself would disappear into CSX Transportation. The Louisville and Nashville has its beginnings in 1850 when the State of Kentucky granted a charter for the railroad to build between its namesake cities. It took nine years for the railroad to complete its original main line and it opened in 1859 with a connection to Memphis established by 1861. The Civil War all but halted construction on the railroad and because L&N lines ran through both North and South territory the railroad had several miles of track destroyed through the course of the war. To the east the Louisville and Nashville gained a connection to Cincinnati via the Cincinnati & Lexington in 1881. By the next decade in the 1890s, the L&N had a vast network in Tennessee and Kentucky giving it access to the rich coalfields of the southern Appalachians and by the turn of the 20th century in 1905 it had a direct main line to Atlanta, Georgia. Atlantic Coast Line, "Standard Railroad Of The South"
Seaboard Coast Line, "We're Pulling For You"
Louisville & Nashville, "The Old Reliable"
Seaboard Air Line, "Through The Heart Of The South"
Through the early part of the 20th century the railroad would continue to expand in the east, mostly by the additions of branch lines to further serve the coal regions and by the time construction and acquisitions died down during this time the L&N found itself in the eastern tips of Virginia. 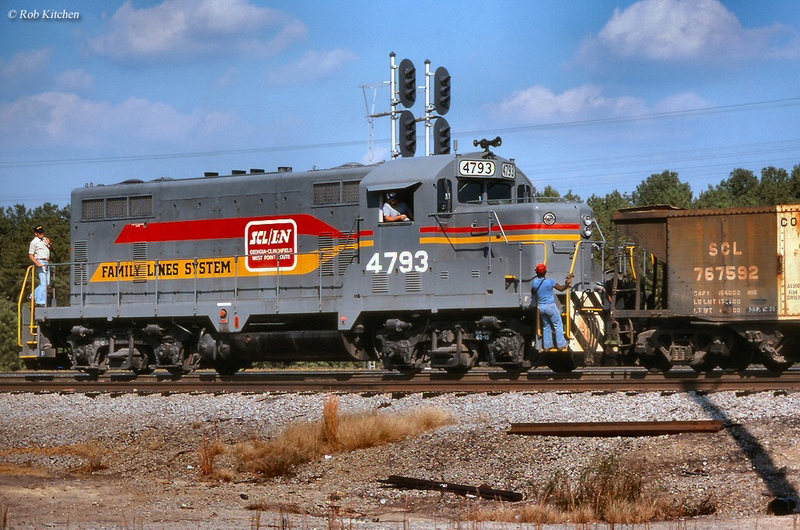 A second component of the Family Lines was the Seaboard Coast Line, which was created just five years prior, in 1967, through the merger of the Atlantic Coast Line and Seaboard Air Line railroads. The SAL is perhaps best remembered for being a somewhat smaller version of the Atlantic Coast Line, and everywhere the ACL went so too did the SAL (and thus it is no surprised that the two would decide to merge in the late 1960s). This is not to say, however, that the SAL was an inferior road to the ACL, quite the contrary. 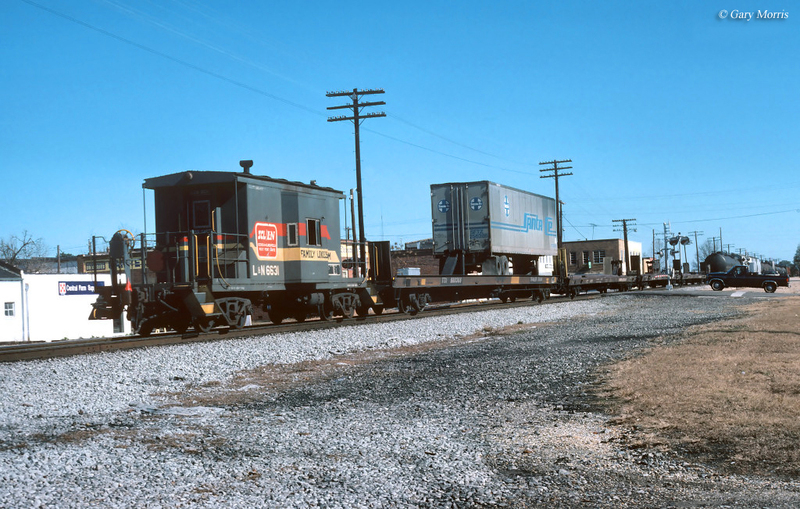 The Seaboard held its own with its fiercest competitor and after managing to pull through troubles during the early years of its life, the railroad provided quality freight transportation to several southeastern markets. The railroads, which made up the SCL was the Seaboard Air Line and Atlantic Coast Line. The SAL was derived over the years from several smaller lines which merged together or were later included under the Seaboard banner. The railroad itself has its beginnings dating back originally to the Portsmouth & Roanoke Rail Road, which was chartered in 1832 to connect Portsmouth, Virginia with Wheldon, North Carolina which sat along the banks of the Roanoke River (and was reorganized as the Seaboard & Roanoke in 1846). The other original components of the Seaboard included the Raleigh & Gaston Railroad (connecting Raleigh and Gaston, NC) and the Raleigh & Augusta Air-Line Railroad (connecting Raleigh and Hamlet, NC which would control both former lines by the 1870s). Together these three lines formed the backbone of the later Seaboard Air Line system, which first began to come together by the latter 19th century when John Robinson took control of the three and merged them as the Seaboard Air Line. Throughout the rest of the 19th century and the first part of the 20th century the Seaboard expanding north and south throughout the southeast reaching cities such as Richmond, Norfolk, Wilmington, Charleston, Atlanta, Savannah, and points west in Alabama (essentially everywhere rival ACL went!). The railroad also built one of the last major main lines in recent memory when it completed an extension to Miami in 1927 (at its peak the railroad was 4,000+ mile system). 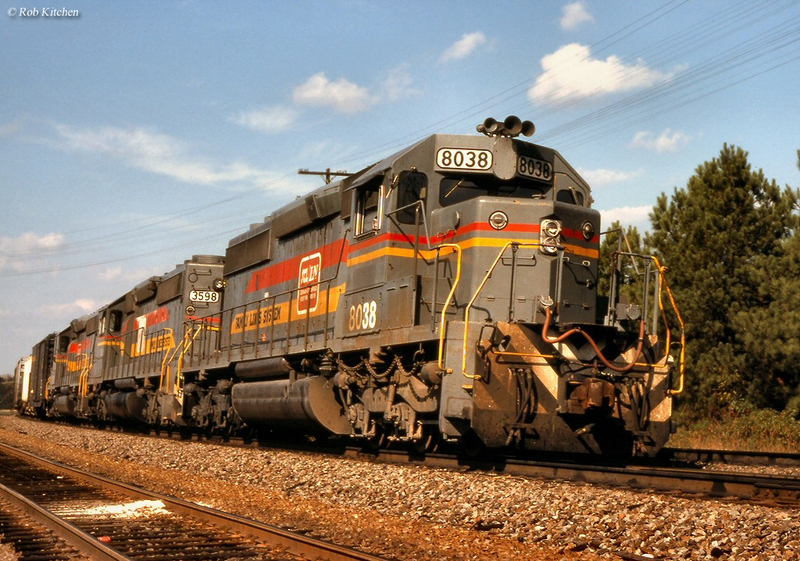 The Atlantic Coast Line Railroad, also known as either the ACL or Coast Line, was synonymous with the South and served points from Richmond, Virginia to Florida and east to Birmingham, Alabama. The railroad was also very profitable being that it served direct north-south routes from Florida to Richmond. It also held one of the most unique paint schemes of any Class I of both its day, having a beautiful purple and silver livery with yellow trim. Remembered in the likes of the Southern Railway in later years the ACL was highly respected throughout most of its existence and like the Southern was blessed with excellent management and never faced any serious bankruptcy (and only entered receivership once during the Depression years of the early 1930s) threat up until its merger with the Seaboard Air Line in the late 1960s to form the new Seaboard Coast Line. The ACL began its life like many classic fallen flags, put together and shaped through a series of mergers with small railroads. Its earliest predecessor was the Richmond & Petersburg chartered in 1836 and after linking with the Petersburg Railroad the two made a through connection from Richmond to North Carolina. Throughout the 1800s there were numerous smaller lines that would go on to form the Atlantic Coast Line including the Wilmington & Weldon, Wilmington & Raleigh, and North Eastern which served points between South Carolina, North Carolina, and Virginia (including the ports of Wilmington, NC and Charleston, SC, along with the capital of North Carolina, Raleigh). The ACL itself would begin to form when all of these railroads came under the control of William Walters, a Baltimore investor. In the late 1800s these railroads would come under the holding company of the Atlantic Coast Line Company. The railroad’s growth would not end with the 1800s. As each of its original lines were slowly merged into the holding company the ACL grew tremendously just after the turn of the century when it acquired the Plant System, a series of rail lines running throughout Georgia and Florida, and took control of the Louisville & Nashville (a classic fallen flag within itself) which served northeastern points from the ACL’s core system. The Clinchfield Railroad was the final major component of the Family Lines System and it is one of the less notable fallen flags, most likely due to its very small size, only a tad over 300 miles at its peak! However, the railroad does hold an important place in railroading history and is best remembered as another of the Appalachian coal haulers, lugging millions of tons of black diamonds from the mountains of Virginia, Tennessee, and North Carolina. Along with the railroad’s association with coal it also served as a very efficient north-south bridge line for traffic of railroads such as the Southern and Chesapeake & Ohio. The Clinchfield has its roots as early as that of the B&O itself, 1827, but its more modern form occurred in early spring 1908 when George Carter merged a number of started, but never finished, railroads in the southeastern Appalachia region into the Carolina, Clinchfield & Ohio Railway. From here Carter set about completing and linking the railroads along with building new as well. This in itself was quite a task due to the very rugged topography. However, Carter would go on to complete the lines and by 1915 had finished the railroad into much of its final form which was a strategic north-south link connecting Elkhorn City, Kentucky with Spartanburg, South Carolina. Not only did Carter finish what would become the railroad’s principle main line, he did so in magnificent engineering fashion managing to keep the ruling grade at under 2%! The railroad was so well constructed that it has changed little over the decades and continues to see many CSX freights daily mostly hauling, you guessed it, coal! 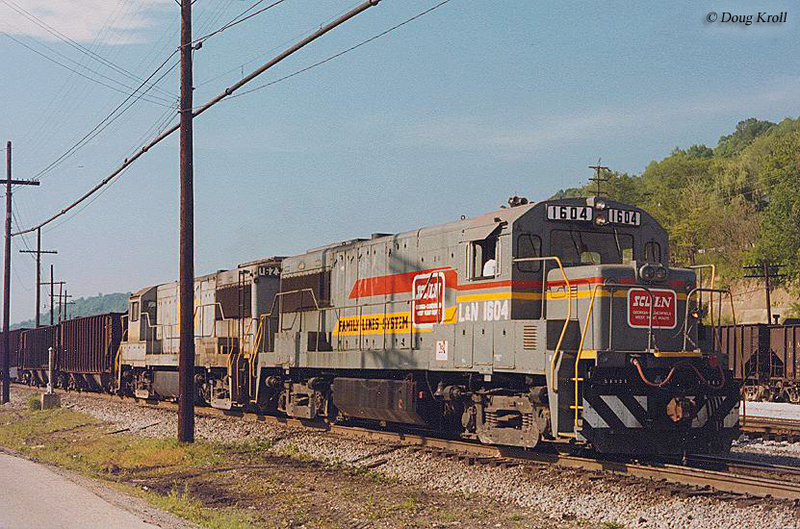 As the 1970s gave way to the 1980s the Family Lines and its affiliated roads would officially be merged out of existence when they all became the Seaboard System Railroad in 1982 under the CSX Transportation banner (which also included the Chessie System) there was little need for so many different company names and the L&N along with its other allied roads were merged out of existence that year. While the L&N is no more today the system and railroad it left behind continues to be an important part of CSX’s southern lines.